Living The Dream Book Release! LIVING THE DREAM: Jenny and Mark move to a small artist community in NM, dreaming of living off grid and homesteading only it’s not as easy as the magazines make out. A light hearted look at the Green and Sustainable Living movement as it plays out in the desert mountains of the Southwest. SARAH LEAMY won the NM/ AZ Book Award in 2012 and was a finalist in 2014. She is the author of three other novels set in New Mexico where she makes her home. Paperback and Kindle versions are available online. 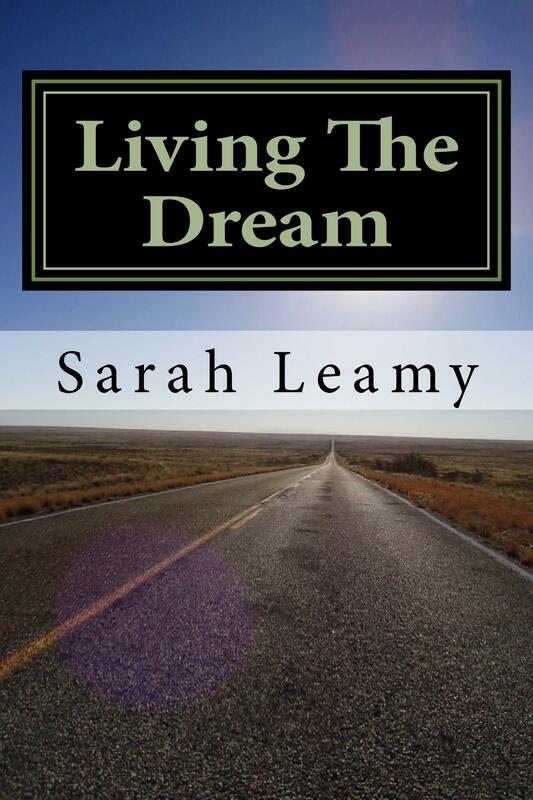 ABOUT THE AUTHOR: Sarah Leamy was the younger boring little sister who suddenly left her English life with an honours degree in languages from London University and became a broke nomadic wanderer, storyteller and writer. She finally settled in New Mexico in her late twenties although she’s still taking extended road trips when she can. As the socially awkward and insecure Brit abroad, she lived first in Europe and then crossed the States and into Guatemala, performing, writing and working odd jobs as she explored new countries alone or with Daisy, her slightly grumpy Border Collie. She has lived off grid most of her adult life, mostly because she’s too cheap to pay some big mortgage for a place she could build herself. It seems to work for her, and her three walled adobe structure in the Ortiz Mountains is now a cozy, colorful insulated home with doors and windows and even a wooden floor! It’s heated by wood, with solar electricity, rain catchment, heat on demand hot water, and the various rescued animals appreciate the comfort. So does Sarah. Since settling in NM her strories, essays, and articles have been published in numerous magazines, newspapers in London (The Pink Paper), Madison (The Edge), San Francisco (Circus News), in Vermont (Rovers North Magazine) and New Mexico (The Madrid Arts Quarterly), as well as in anthologies such as The People’s Apocalypse by Ariel Gore. Her second novel won Best Fiction in the 2012 New Mexico/ Arizona Book Awards, and was a finalist with her third, Lucky Find. Locally though she’s become more known as the odd Englishwoman, a performer and storyteller, into building her own off grid home in the hills, rescuing dogs, cats, chickens and even donkeys, who now and again appears with another novel or article in hand. LIVING THE DREAM (2015): Jenny, a teacher from Olympia, WA moves to New Mexico with her musician boyfriend. They decide to give up all the conveniences of the city and follow the dream of an off-grid, sustainable and trendsetting green lifestyle in a small rural community. Just the thing to spice up their relationship, and it’s cheaper than having a kid. They arrive in the high desert, following the GPS directions, and struggle to find the forty acres and a schoolbus. Quickly humbled by how little prepared they are, they try to settle into a rather unique small town. Only it’s not as easy as the magazines make it seem, this off grid lifestyle that is. LUCKY SHOT (2011): “Readers who enjoy vulnerable, flawed characters will find themselves engaged by Lucky’s courageous attempts to leave the past behind. Leamy’s writing is solid, but the book’s tendency to jump between the past and the present can be distracting. Still, readers will ultimately be inspired.” Kirkus Review. LUCKY SHOT was a finalist in the 2012 Dragonfly Book Awards and won Best Fiction in the 2012 New Mexico/ Arizona Book Awards. LUCKY FIND (2014): Lucky and Mike, best friends since childhood, travel through New Mexico and into Arizona, accompanied by Blue, a collie mix. Looking for Lucky’s newly discovered half-sister, these friends search across the Southwest, including visits to Las Cruces, Bisbee, and Flagstaff. The clues they follow begin resembling something an undercover genealogist might dream up. Over the weeks, Lucky unscrambles the past, one that challenges stereotypes of family, friendships, and gender, while laying a few good secrets to rest. Meanwhile, Blue, being a most generous dog, embarks on her own search and rescue mission, finding a needing-to-be-bottle-fed pup aptly named Peanut. It’s the two dogs – and soon Blue’s tiny kitten foundlings – that give this archetypal hero’s journey a mixture of heartbreak and comic lightness. LUCKY FIND was a finalist in Best Fiction in the 2014 NM/AZ Book Awards. WHEN NO-ONE’S LOOKING (2010/ 2015): Passionate, funny, bittersweet, and most definitely obsessive, this is a story of love and hate in equal measure, a messy and secret affair that spans six countries and five decades. Joey is dying, but no one else knows. Joey reluctantly tells Paula, who’s been a close friend since the sixties. They spend snowy days sitting on a cabin deck in Northern New Mexico laughing together. The two start planning a Thanksgiving gathering in their small local town of Madrid, New Mexico, to celebrate Joey’s life. But Joey has a second woman of importance; Kat and Joey have been on-again/off-again lovers for the last fifty years. A random encounter at a tavern in New Mexico changed Joey’s life drastically. Even though they fight constantly, they always end up back together every few years. The two first came together in 1967 in Santa Fe, then again during the Civil war in Guatemala, the start of Glasnost in Russia, the Eighties in Spain, and in Britain during the late Nineties. Theirs is a love that almost kills. THE MINE SHAFT TAVERN Patio Bar, 2846 Highway 14, Madrid, NM 87010. With information on living off grid, permaculture, gardening, solar and workshops for those interested in finding out more!